It’s not surprising children love beekeeping, especially when using Flow technology. Our hive observation features provide a window into the fascinating world of bees, while harvesting straight from the Flow Frames allows for the exciting opportunity to taste the different honey flavours stored within each frame. Flow Hive technology drastically reduces the chance of being stung during harvest, however even the friendliest hive can get cranky sometimes. Whilst sharing your beekeeping experience with children it’s important to ensure that you provide the best sting prevention possible. Luckily it’s easy to Bee Prepared with our organic cotton kids suits. This beekeeping suit is manufactured from our highest grade, unbleached, GOTS certified organic cotton and features an emblazoned Flow logo on it’s breast pocket. Equipped with durable, high quality YKK zippers, a fully removable fencing veil, plus anti-bunch elastic thumb and ankle stirrups– these suits are the ultimate in beekeeping sting prevention. Lightweight, ventilated gauntlet goatskin gloves complete the package, ensuring your child will feel secure from head-to-toe. Children should always be supervised by an experienced adult beekeeper. This beekeeping kit includes our highest grade, unbleached, GOTS certified organic cotton beekeeper suit emblazoned with the Flow logo on it’s breast pocket. Equipped head-to-toe with durable, high quality YKK zippers, a fully removable fencing veil, plus anti-bunch elastic thumb and ankle stirrups – these suits offer the ultimate in sting prevention. Suit: Remove veil from suit for machine washing in cold water. Tumble dry low. Remove promptly. Best to air dry in shade. No bleach. Gloves: Hand wash in cold water. Hang to dry in shade. Do not use dryer. No bleach. What child bee suit size should I pick? 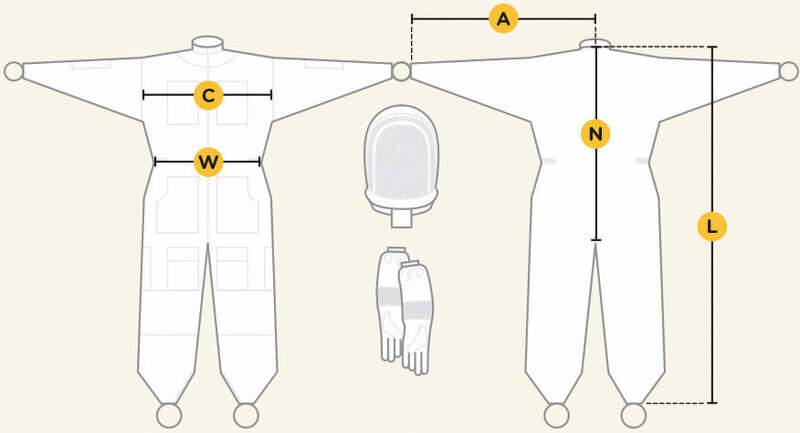 Bee suits are designed to be worn over normal clothing, so we suggest you select 1 size larger than you normally wear. NOTE: The sizing chart below provides measurements of the suit fabric itself. In order to properly use this chart you need to compare the chart to your own body size measuring over the top of your clothing and include additional length for movement (to allow ankles and wrists to remain covered). Be sure to give yourself plenty of room to move around. Beekeeper suits are typically worn slightly baggy- you do not want these to be tight fitting. It is the loose fitting cotton material that keeps you from getting stung by angry bees. The most important measurement for sizing is the torso, or 'nape to crotch' in the sizing chart shown below. To properly calculate this measurement, measure your own body from the top of your shirt collar to about 15cm / 6in below the bottom of your crotch. The next measurement to consider is the 'waistband circumference' which is an elastic waistband. You will want the elastic waistband to be comfortable for your individual size. Please note, due to the popularity of these suits we will sometimes run low on inventory in some sizes. If your size is out of stock, you can order a larger size or contact us for the estimated restocking time. Beekeeping suits and other personal protective equipment can offer excellent prevention against bee stings, but are not 100 percent effective. It’s important new beekeepers exercise caution when tending to their hives and are comfortable with the fact that sooner or later, all beekeepers get stung.